Simple construction. Strong, fast and comfortable boats which have accomplished many ocean crossings and important voyages including circumnavigations. Superb steering control, high stability, large tank capacities and good aesthetics. 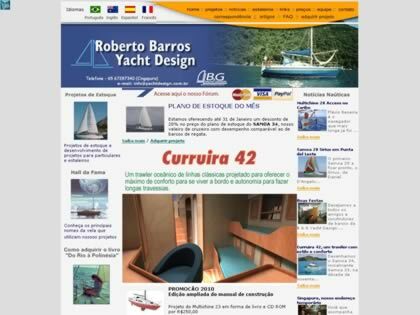 Web Site Snapshot: If available, above is a snapshot of the Roberto Barros Yacht Design web site at http://www.yachtdesign.com.br/ as it appeared when this site was added to the directory or last verified. Please Note that Boat Design Net has no involvement with the above web site; all content and images depicted in the above thumbnail are the property and copyright of Roberto Barros Yacht Design unless otherwise noted on that site. Description: Simple construction. Strong, fast and comfortable boats which have accomplished many ocean crossings and important voyages including circumnavigations. Superb steering control, high stability, large tank capacities and good aesthetics.